Stevenson had given the visitors an early lead before three further goals in the second half sealed a convincing win for Cuikie. Penicuik now just need a point at home to Musselburgh to win the league. Co-manager Tony Begg said: “We’re delighted with the three points, we knew it would be a difficult place to come. First half we weren’t so great and weren’t our fluid selves. Credit to Tweedmouth for that they made it difficult, I thought second half we were much better and their goalkeeper was in inspired form. Penicuik travelled to England last week to play their penultimate league match against Tweedmouth Rangers and got off to the perfect start when Stevenson curled a free kick over the defensive wall and keeper Fletcher into the top corner of the net. One minute later, Williams rose above the home defence to power in a header, but keeper Fletcher was well placed to save. In the 12th minute, a Caddow volley went just wide of the goal. Then, another corner to Penicuik saw Williams again get the better of the defence, but his header hit the upright as the referee adjudged Williams had pushed the defender. With the home defence under constant pressure, a glancing header by Ponton went inches wide of the upright. Caddow again came close with a first time volley that flashed past the junction of the bar and post. 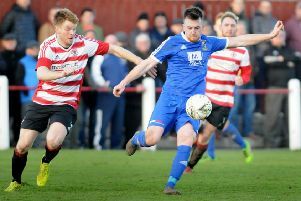 Penicuik continued to create chance after chance but the finishing touches were missing and the score remained unchanged at half time. Two minutes into the second half and Penicuik doubled their lead. A pass from McCrory-Irving set up Caddow 30 yards from goal. He took a touch and curled the ball into the far corner of the net as keeper Fletcher looked on. One minute later, Fletcher dived low to his left to deny a Baptie strike. In the space of two minutes, substitute Somerville had two powerful shots on goal but failed to hit the target. Centre back Williams, always a threat at dead ball situations, came close with a header at a corner kick. In the 75th minute, McCrory-Irving crossed the ball to the back left post, Somerville nodded the ball down and McIntosh rifled the ball home past Fletcher. With Penicuik pressing continuously, keeper Fletcher was at full stretch to deny Connolly with a top class save. In the 89th minute another superb save by Fletcher saw him turn away a McCrory-Irving pile driver for a corner kick. From the corner, Connolly rose above the defence to power home a stunning header to round off the scoring. Penicuik: Watt, Stevenson, Baptie, Young, Williams, Connolly (c), Caddow, McCrory-Irving, McIntosh, Crabbe, Ponton Subs: Sampson, Page, Sproule, Somerville, Hamilton, Cordery.